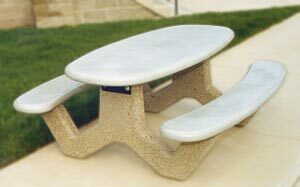 Precast concrete picnic tables offer several advantages for outdoors use. The steel-reinforced concrete provides a super durable long-lasting construction that deters vandalism and theft. The oval shape tops and curved seats come in a smooth finish while the w-style frame is available in a variety of finishes, color options are as shown. Tops & Seats - Smooth Finish Options. Umbrella Hole option is available. Universal access model are design with one-side overhanging to allow wheelchair and toe clearance. 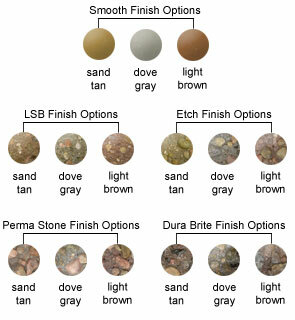 Models in both standard and universal access are available with cast in umbrella holes. Some assembly required.